Abstract: On paper both the ATI 'RD580' Crossfire Xpress 3200 and nVidia nForce 590 SLI chipsets have a very similar feature set. The recent AMD/ATI merger will undoubtedly shake things up in the chipset and motherboard markets for many months to come, although both companies are for the moment continuing on in their respective road maps undeterred. ATi's CrossFire Xpress 3200 chipset is as you know in direct competition with nVIDIA and its many SLI capable nForce chipsets, offering up an alternative core logic for AMD Athlon64 socket AM2 and socket 939 processors. Choice in chipsets is grand, but let's separate the ATI Crossfire Xpress 3200 chipset from the ATI Crossfire Edition videocard's for a moment first - the two cornerstones of ATI's chipset and GPU family's are vividly different in terms of their success. While the ease of enabling SLI has really propelled nVidia's dual videocard solution into a mainstream product realm, ATI's 'Crossfire Edition' videocards seem destined to languish in obscurity for the rest of eternity. The number of Crossfire Edition videocard reviews PCSTATS has embarked upon (current count: zero) is a striking indicator of just how scarce a dual videocard ATI Crossfire Edition set up is compared to nVidia's dual videocard SLI offering... Put another way, it's telling when none of the major 3rd party manufacturers submit a major component of one of the "big two" videocard companies product lineup for review. Many ATI and nVidia videocards have passed through the hallowed PCSTATS labs, but thus far the only dual-videocard rigs we've seen have borne an 'SLI' sticker. From this perspective it's easy to draw conclusions on which dual videocard technology manufacturers have been putting their stock behind. On paper both the ATI 'RD580' Crossfire Xpress 3200 and nVidia nForce 590 SLI chipsets have a very similar feature set. The ATi SB600 chipset has support for six Serial ATA II slots however two are dedicated to eSATA use (ECS neglects to include them here). The Xpress 3200 chipset does not support advanced workstation style networking technologies akin to 'Firstpacket' or 'Dualnet', but of course these are generally features of peripheral importance. ATi's CrossFire Xpress 3200 matches up very well against nVIDIA's nForce 570 SLI chipset too, incidently. PCSTATS will delve into these matters as we evaluate the latest motherboard to pass through the PCSTATS test labs, the new ECS Extreme KA3 MVP. The ECS KA3 MVP Extreme motherboard is built upon the ATI 'RD580' CrossFire Xpress 3200 northbridge and ATI 'SB600' southbridge, and it supports all socket AM2 processors on the market from the AMD Sempron right on through to the dual core AMD Athlon64 X2 & FX. 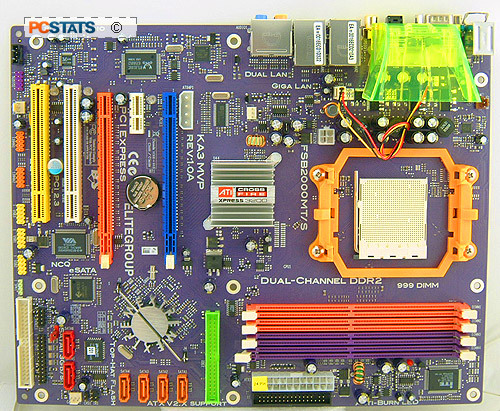 ECS' KA3 MVP Extreme motherboard accomodates 8GB of DDR2-800 memory in a dual channel configuration via its four 240-pin RAM slots. Onboard goodies of note include; 7.1 channel High Definition Audio, dual network cards (one Gigabit, the other 10/100), an additional Jmicron 'JMB363' SATAII/IDE RAID controller (two 3GB/s SATAII channels, one Parallel IDE UDMA 133) to supplement the four Serial ATA II channels from the ATi 'SB600' southbridge, and 400Mbit/s IEEE 1394a Firewire. Peripheral expansion comes care of a PCI Express x1 and two 32-bit PCI slots. The two PCI Express x16 slots are reserved for videocards, and operate with 16 PCI Express lanes each that connect directly to the 'RD580' Crossfire Xpress 3200 northbridge. This is the only chipset in production which supports two PCI Express x16 slots unto itself. The ECS KA3 MVP Extreme motherboard retails for about $145 CDN ($130 US, £68 GBP), and comes with a big pile of accessories. The ECS KA3 MVP Extreme is a full size motherboard at 300 x 244 mm, and overall ECS has done an excellent job with the motherboard layout. 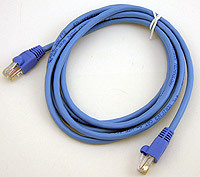 Most sockets and connectors are easy to access. The user is a clearly illustrated and well documented. The KA3 MVP Extreme motherboard is multimedia ready thanks to its single IEEE 1394a port, 10 USB 2.0 ports and eSATA port! To access some of the ports you'll need to use extension brackets, but most of these are included and the one which are not can be picked up at your local computer store. If you intended on using an older ATX 1.4 spec power supply, the ECS KA3 MVP Extreme is compatible with older 20 pin power supplies. Just make sure you have enough amps on the +12V line (30A+ recommended) and you should be okay. If you plan on running dual CrossFire Edition videocards, we recommend that you look at ATi's suggested power supply list for a compliant model. Round back, the I/O ports consist of a pair of network jacks (one 10/100, the other Gigabit Ethernet, the audio jacks and in place of where the parallel port traditionally goes, a fan exhaust. The bright green plastic air scoop and 40mm fan are intended to quickly remove some of the hot air generated by the socket AM2 AMD Athlon64 processor and power MOSFETs from the case, thereby lowering overall internal temperatures. The fan is 40mm fan (which is replaceable) is very quiet and does a decent job at expelling hot air from the system. The parallel port has been moved to a bracket, which is bundled in. 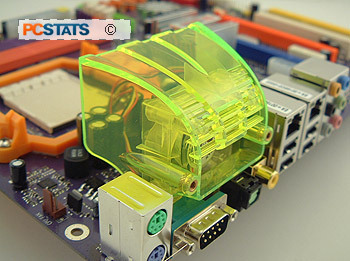 An overview of what the ATI Crossfire Xpress 3200 brings to the socket AM2 table is next, along with ECS' unique BIOS protection tools. Pg 2. Accessories - Everything but the kitchen sink?